Earlier this week the Northern Hemisphere experienced the first day of summer - aka, the longest day of the year. So from here on out, the days get shorter and the nights get longer, and you know what that means: winter is coming! The premiere episode of Game of Thrones opens with three members of the Night's Watch on patrol north of the Wall, when they run into what appear (if you haven't read the books and thus don't know what's coming ["Winter"? --ed.]) to be some kind of snow-​zombies. Just like regular zombies, the fresh ones still look mostly human, while the ones that have been around longer are further gone. It's only later that you learn these aren't two examples of the same thing, but rather wights and the White Walkers that control them. It should be noted that, in the books, only the Wildlings call them "White Walkers" - the general term used by the Westerosi is "the Others," but there are two reasons the TV show doesn't use that term: 1) you can't hear people pronouncing capital letters, so it would just sound like they were talking about random other folks (cf. "seeing the doctor" vs. "seeing the Doctor"); and B) even if we did hear the capital O, it would sound like a reference to Lost. When the White Walkers appeared in the first episode, their design hadn't been finalized yet. Screencaps revealed something that looked like severe frostbite, which does make sense, but isn't what this figure represents. This is the version seen at the end of Season 2, played by Ross Mullan - yes, hard as it is to believe, this is makeup, not digital effects. In the books, the White Walkers are described as oddly beautiful, like fairies (but made of ice). The show clearly didn't go that route, opting instead for something gaunt and dessicated, like a body mummified by the cold. His cheeks are sunken, his brow is large, and he has a wispy beard and long white hair (which, it must be said, has a bit of an old "NECA wig hair" thing going on). The body has all the same anatomy as a human being, it's just dried out and stretched taut over his bones - you know, prominent ribs, clavicles, and shoulder blades, all barely held together by skin that looks like beef jerky. 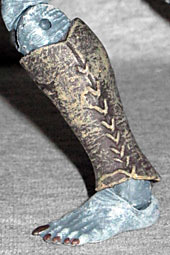 The only clothes he wears are a leather loincloth, bracers and greaves. In the books, they wear full armor that is highly reflective and thus helps camouflage them as they move through the forests and the snow. The articulation is just a bit better than the other Game of Thrones action figures: like them, he has a balljointed head and neck, swivel/hinge shoulders, elbows, and wrists, a balljointed torso, balljointed hips, swivel thighs, double-hinged knees, and swivel/hinge ankles, but he also gets an extra ankle swivel; there's a swivel going into the foot, which duplicates the range of motion provided by a rocker joint, then a hinge in the middle of the ankle, and finally another swivel going up into the shin. Why the extra joint? No idea. It's not like he has a horse to ride. The joints are all made from clear plastic, so be careful with them - that stuff's easy to break. Speaking of breaks, the White Walker is armed with a spear. All the Walkers' weapons seem to be made from ice, so this is basically a big icicle on a stick. So that's cool and all, but they decided to make the actual blade part from clear plastic for maximum icy-osity. Unfortunately, the tiny tab that connects it to the body of the spear was too brittle, so it snapped before I'd even opened the box. Better to have a break there than in any of the figure's joints (this is easy to glue). 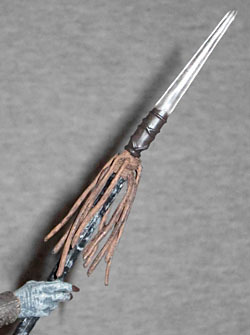 When it's in one piece, the spear is 6⅝" long, and can be held in the right hand. If a book White Walker met a TV White Walker, they wouldn't recognize each other - they may serve the same role in the story, but they're drastically different kinds of monsters. Imagine if, on AMC's The Walking Dead, the survivors were beset by vampires - it's still a creature that bites people to turn them into more of its own kind, but it's not the same as a zombie, right? 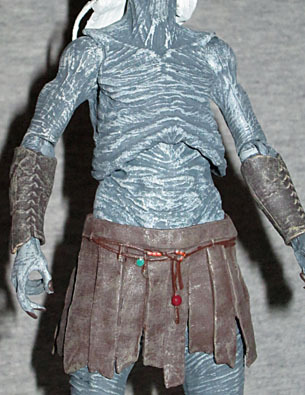 Which version of the White Walkers is better is up to you, but either way, this is a very good toy.